In the movies, felling a tree looks very easy and like anyone can do it. In reality however, most people are advised to hire a professional when they want that tree gone. Of course, there are situations when hiring someone isn’t an option, and you’ll have to do something about the tree, by yourself. Felling a tree is done with a chainsaw, but of course there are many other uses for this tool. As such, many homeowners choose to also have one in their tool shed. If you never owned such a tool before, and you’d like to learn more about how to use a chainsaw, you came to the right place. Reading the manual of any electric item you purchase should be a no brainer, though there are many folks out there who skip this important step. That manual not only tells you how to turn the device on or off, but many other useful information. For instance, it informs on the functions the machine can perform as well as what restrictions you have when using it. Additionally, not all models may feature the same parts, or have them placed identically. The manual might also shed light on the differences between the current model and any others it replaces. If you want to use a chainsaw on your own, you should take some lessons first, from someone who knows how to operate them. This step is similar to learning how to drive or build furniture, as nobody knows those things from birth. A professional will be able to give you good tips on how to hold the machine, how to position your body, or where to start cutting. You’ll also learn why sometimes you’ll have to stop what you’re doing and find another spot. You might even need to stop using a chainsaw, and use another tool. The best part of these classes is that sometimes they’re offered by the seller of the product, so you won’t have to search for too long. Knowing how to use and how the chainsaw works are the first steps towards ensuring your safety. Having a good body position in regards to the object you’ll cut, or where to cut, are other aspects of making sure you, other people, or items around you are safe. Make sure no pets or children come near you when the machine is operated, as you’re likely not to hear them, and could injure them badly. Don’t ignore wearing protective gear either, so we’ll talk about it next. 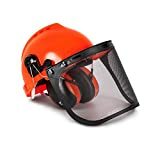 Safety googles and a helmet are the first safety gear to consider wearing when operating a device with a very sharp blade, though those things won’t be enough to protect you from the chainsaw dangers. 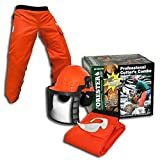 You’ll also need protection for your ears, a pair of sturdy boots, gloves, as well as a shirt with long sleeves and chainsaw chaps. You’ll need the googles to avoid dust and other particles getting into your eyes. The helmet is particularly useful when chopping off tree branches or felling the tree. It will protect your head, should the tree fall in a different direction, or against anything else falling on your head. You might want to invest in a helmet that has ear flaps and a protective face net as well, as you’ll be wearing less items, and you’ll be sure to always have them all on hand. You really should cover your ears as the chainsaw is noisy, and can cause deafness. Make sure to search for some really good noise cancelling phones for this purpose. The boots should be sturdy so they’ll help you stay stable while cutting. Additionally, these will protect your toes as well from impact, or they can help you better climb the tree, if you need to. 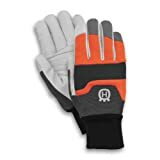 The gloves and the long sleeves will protect your hands and arms, respectively, especially against small flying debris that can easily scratch you. The gloves can also help you when holding chainsaw. 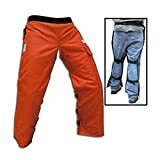 The chainsaw chaps though, might be one of the most important piece of protection. These chaps have a few layers of Kevlar that can stop the blade in a second, should the machine bounce back towards your. And for those who wonder what Kevlar is, it’s the same filling used in bullet proof vests. We mentioned earlier that each chainsaw model comes with instructions and work a bit different. Despite having said that, there are a few tips you should know, that apply to all models. To better use the machinery, you need a proper stance and good footing, with no risks of tripping or slipping. When you also have a good grip on its handle, you’ll be able to better operate it. You’ll have to pay attention to wrap your thumbs around it for this purpose, and hold it firmly. Since we used the plural there, it means that you have to keep both hands on the handle, as you’ll have better overall control. A firm grip means better control of the dangerous blade, especially when it gets pinched. Remember there are higher chances of the blade getting pinched when using its tip first, thus avoid doing so. Before starting the machine, check the chain for sharpness and a good tension. If the blade gets pinched, then it will be pushed back at you, at full speed, and you won’t want to feel that first hand. Learning more how to cut with a chainsaw on smaller items before trying to fell a tree, is always a good idea. Like mentioned earlier, when felling a tree you have to ensure that when it falls, the tree won’t cause damages or injuries. We mentioned that animals and kids should definitely not be around, but that’s not all you should know. In fact, several measures revolve around the tree itself, rather than the tool you use. Depending on where the tree is, you’ll have to ensure it won’t get entangled in the power lines, or that it won’t fall on some house or a car. It’s also recommended to have at least one more person with you when performing this action, as you might need their help to keep the area free of animals or other people. They’ll also be able to keep an eye on branches or other stuff that could fall from the tree, as well as the direction it will fall in. However, depending on how large the tree is, the safe area has to be equally large. There’s an easy trick to roughly estimate the minimum space. You’ll need to hold onto an axe, extend your arm in front of you and close one eye. Now, compare the handle of the axe with the height of the tree, and slowly walk backwards until the tree appears to be equal to the handle of the axe. Now you can better decide which way to make the tree fall. Keep in mind, that despite your best efforts and all the chainsaw safety tips you could possibly be aware of, the tree could fall in a different direction if the branches are not spread evenly around the trunk. No matter the model of chainsaw, there are a few rules you must follow if you want to be safe and for the machine to always work well. For starters, you have to ensure it sits on a flat surface first, especially if you’re a first time user. It’s even better if the surface in question is the ground. Before you attempt starting it, check its controls, the bar, the handle, and all other parts. Then, fill the tanks with oil and especially fuel for the later is supposed to run out first. When the oil runs out, the parts of the engine will rub one against the other, and the machine will heat up. You’ll want to place the chainsaw on the ground, when filling the tanks, as well as avoid smoking. By refilling the tanks before each use, even if there is enough liquid in both, you are actively maintaining the device. If you want to start the chainsaw between your legs, hold it tilted towards the right, with the back against your right leg. The left leg has to squeeze its back, for support. The next instructions apply to both leg and ground launch. Use your left hand to hold the handlebar, and pull the start rope with the other one. You should hear a pop-sound after a few pulls, but not have the machine start. After the pop-sound, turn off the choke and pull the rope again. Now it should start. Note that for the ground start, you’ll have to put your right foot in the handle at the back, next to the throttle. Since the chainsaw is a very dangerous cutting apparatus, you should make sure you store it properly. This means that nobody should have easy access to it, especially if they don’t know how to or can’t operate it. The easiest way to do so, it to put it away in an industrial storage locker, for instance. This way, it is protected from the elements as well, not only from those who aren’t supposed to touch it. As far as maintenance goes, your most important instructions are in the users’ manual. However, there are a few chainsaw tips and tricks you can still learn from others, especially when it comes to maintenance. For instance, you’ll want to use fuel that is all petroleum-based, and not the one with ethanol. The later, can in fact ruin the inner parts of the cutting machine in matter of weeks, though the process can be slowed down with a stabilizing agent. You’ll also want to buy small quantities of fuel – enough for a month, and whatever quantity is left over, to empty in your car’s fuel tank. You’ll also use your chainsaw for longer with a good quality bar and chain, combined with a 2-cycle oil, which even lasts for longer. You’ll also have to keep the various parts clean or sharp, and this includes removing the chain off the bad and cleaning its groove. There are specially designed sharpeners for the chainsaw, and by learning how to use them you’ll actually replace the chain itself at much rarer intervals. The recommended time between two sharpening sessions is 3 uses. Despite it looking like a tiring and never ending task, sharpening the chain will last less than half an hour. If you’re still not convinced, do know that a safe chainsaw is a sharp one as there’s less of a risk of an accident to happen, since it will function easier and faster.